The Bureau for Paranormal Research and Defense (the B.P.R.D. or BPRD) protects America and the rest of the world from the occult, the paranormal, and the supernatural. 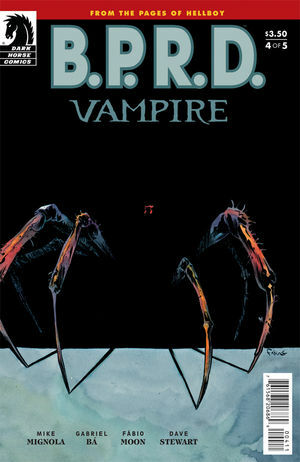 The new comic book series, B.P.R.D. : Vampire is a direct sequel to B.P.R.D. : 1948 and is separate from the main B.P.R.D. series. The five-issue miniseries is produced by writer Mike Mignola and co-writers/artists Gabriel Bá and Fábio Moon. It is set in 1948 and follows Agent Simon Anders and his quest for revenge against a clan of vampires and its Gorgon-eyed queen, Hecate. After consulting “witch maps,” Anders travels to Cesky Krumlov, Czechoslovakia. There, he and his guide, Hana Novarov, find Krumlov Castle, where Anders meets the conniving vampire sisters, Katharina and Annaliese. B.P.R.D. : Vampire #4 opens after Agent Anders’ battle with Lord Wilhelm. His time in Krumlov Castle has changed him, however. Now, he faces a small army of witches, and they want to kill him. Meanwhile, Hana calls B.P.R.D. Headquarters. THE LOWDOWN: Now, that B.P.R.D. : Vampire has reached its penultimate issue, it becomes obvious why press material for the series refers to Agent Simon Anders as “doomed.” The confrontation between Anders and his “guests” and a gathering of witches is worth the price of admission. Gabriel Bá and Fábio Moon have not run out of ideas; their art for this series is as visually arresting as ever. The striking colors by Dave Stewart remind that B.P.R.D. : Vampire is a graphical narrative. The pictures tell a story that is as impressionistic and psychological as it is literal. You have to read the art and graphics to get the full impact of this story. I’m ready for the finale. POSSIBLE AUDIENCE: Fans of Hellboy and of good comic books will want to read B.P.R.D. : Vampire.